I like to keep my apartment floor clean, as I enjoy walking around with bare feet after a shower without having to worry about them becoming dirty. As such, I don't like shoes beyond the doorway in my apartment. When I have friends over they'll often forget about my no shoes policy and come right in with their shoes on. I have a shoe rack right next to the door as a visual reminder for those who come over and I also try to bring up the topic of shoes on the way to my apartment with my more problematic friends, but they'll still forget or not realize that I don't want them walking around the apartment with their shoes on. How can I enforce my no shoes policy to prevent people from coming into my apartment in their shoes? By the way, just remember to take your shoes off when you come in! I'll get an "okay" or a "sure," while we're walking, but when we get to my apartment I'll open the door and start to take my shoes off while they come right in and begin setting up the game we're going to play. I would think that the reminder, along with me taking my shoes off myself would be enough, but I think they see it as I'm taking my shoes off since this is my apartment and I want to be comfortable, and they're thinking about the game we're going to play and so forget my warning. My dentist handles this by handing people slippers as they arrive on rainy days. I think you can adapt the technique quite well. 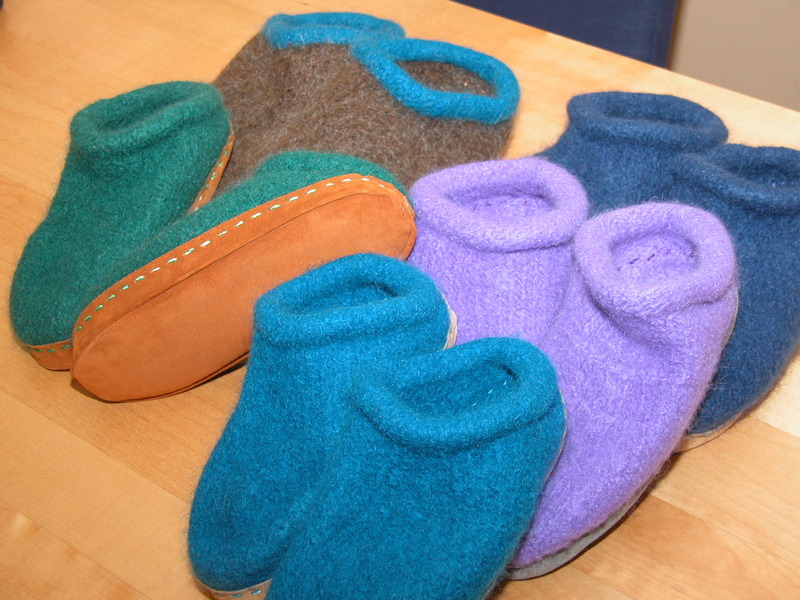 Get a variety of soft loose slippers with nonslip soles somewhere inexpensive like a dollar store, and some sort of basket or the like to keep them in. Something soft, stretchy, that covers the whole foot (not something backless or toeless) and don't have to fit perfectly. 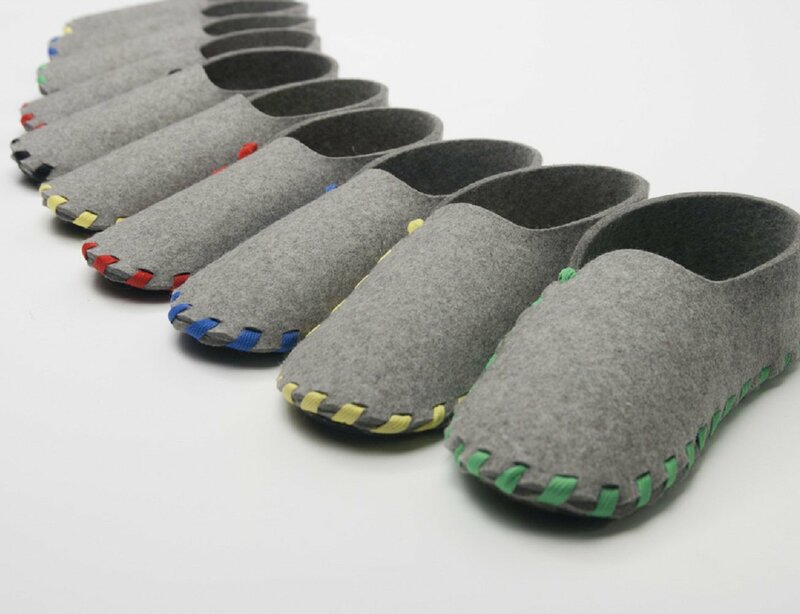 Ideally some would be warm and some would be cool and you would have various sizes, and make them available for people to replace their outdoor-dirty shoes with, while covering up their long toenails, smelly feet, holey socks, or anything else that might make them feel embarrassed without their shoes. Hey! Great to see you! Come in, come in! Do you need slippers [wave the pair in your hand or point to the basket of them near the shoe rack] or are you ok in just your socks? I can clear this junk off the bench if you need to sit to get your shoes off. You're being welcoming, friendly, helpful and positive while making it clear that in your place, the shoes come off. Anyone worried about their sock situation can take the slippers to cover up the holes or whatever else they don't want you to see. Everyone gets the clear message about your norms. Once someone kicks their shoes off, accepts the slippers, or sits on the bench, you can turn away to give them privacy in case they don't want you to even see their unshod foot for a moment. You can walk away from the door and move on to the next business, such as offering them a beverage or inviting them into the living room or whatever. It won't take more than a visit or two to establish the new habit, and then you might just let them in and ask "slippers?" since they might want them some days even though they hadn't before. I think right when people come in, either when you greet them or walk in with them, a simple "Can you please take your shoes off?" will suffice. If you ask beforehand, people will likely forget, as they are excited for the coming activity. Taking off shoes at the door is fairly common practice, so it shouldn't take anyone by surprise. That said, many people do wear shoes in their homes. Your friends are probably not purposely messing up your apartment, they are used to other places where they do keep their shoes on. So they will likely agree to your request. If anyone pushes back, claiming their shoes are clean, you could say "I prefer you not wear your shoes in my apartment, even the cleanest shoes bring in dirt from outside and contribute to wear and tear on the floor." This makes it clear that you expect this behaviour from everyone, all the time. If they still refuse, you will have to decide if those people are still welcome to come over. You should also consider special circumstances, some people have foot or leg issues that make it very uncomfortable to not wear shoes. People tend to forget the "house rule", even if they have visited several times. People who do not do this themselves are not used to taking off their shoes; they take time, are messy and sloppy (*). My friends and family go along fine. Strangers, so far, are less surprised than I expected, and comply without complaints. 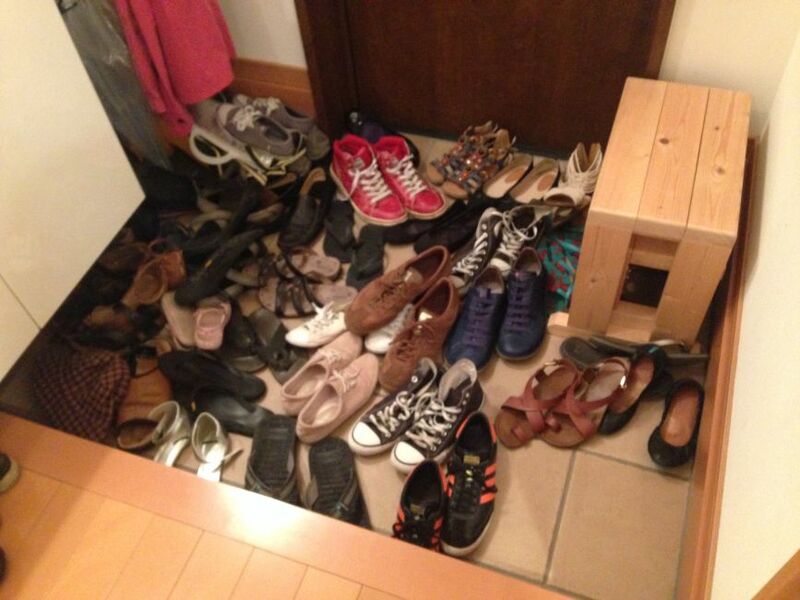 In Japan, where this policy is pervasive, houses and flats have a small area inside, just beyond the entrance door (genkan) where people take off their shoes. There is a step going from there to the rest of the house. This makes a very clear distinction between "inside" and "outside". In my home (small flat, no genkan), I noticed that when there is no such demarcated area people do not know how far in to go with shoes on, and where to take them off. That is the (*) "sloppy" part above. So I put something on the floor (black rubber mat), about 1.2m x 1.3m (the size of the entrance), and now it is clearer for them how far to go with shoes on [still not perfect, though]. 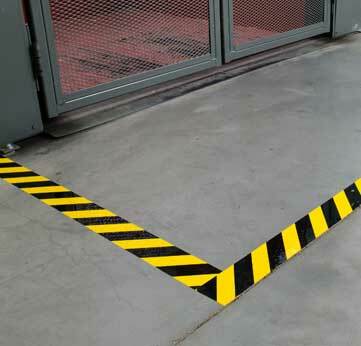 I suggest you mark the limit clearly and visibly, separating shoes-on zone from shoes-off zone. As others said, do offer slippers and maybe socks. Apart from personal preference, going around bare footed can get your feet cold. Offer seating if necessary. For unfamiliar people that come only once and briefly, such as a plumber, we offer shoe covers. 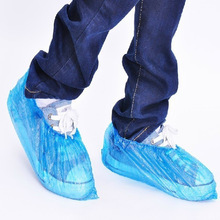 We have the ones you get for operations at hospitals, but any shoe cover will do. People (guests, friends) tend to wipe their feet before entering a home that's not theirs so this mat would be the first thing your guests see before entering. This would hopefully be enough to imply your "no shoe policy" without having to do it yourself each time a guest enters your home. It would also help to re-enforce the rule to reoccurring guests that visit your home who may have forgotten but are quickly reminded by the mat each time they enter your home. A hostess is within her rights to ask guests to remove their shoes -- especially if it's snowing or raining outside. If it makes you uncomfortable, bring an extra pair of your own shoes so you won't have to go barefoot. In fact, she should offer slippers so you won't be cold or embarrassed. That said, a good hostess should be flexible. If she doesn't know her guests well or is having a big party, she should suspend the no-shoes rule, at least for one night. She echoes some of the other answers that say you should offer your visitors slippers, especially if the floor is cold. She even tells visitors that if taking off their shoes will make them uncomfortable then they should bring their own pair of slippers. 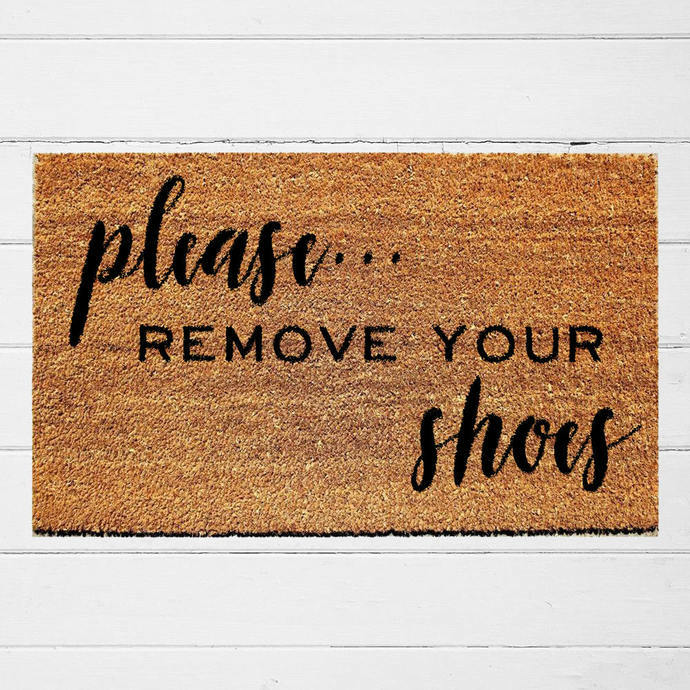 This implies that you (the host) should tell your visitors in advance (not after they show up at your door) about your shoe-removal policy and whether you will provide any slippers. Great, see you at 8 o'clock! Oh by the way, our house has a no-shoe policy. I hope that's okay, I know some people don't like that. We do have slippers for you to wear if that'll make you more comfortable. You're free to wear these, if you don't want to walk around barefoot/in your socks. Hey I know it's a bit of a hassle, but this is my home, and I'd appreciate it if you respected the house rules. I'd do the same in your home. If they still refuse to take off their shoes, then you should probably just be flexible (as Peggy Post said) and deal with it. You can mop up or vacuum the floor after they leave. If it really bothers you, you could consider never inviting them over again. For the case of someone who needs to wear shoes indoors due to medical reasons, you could provide shoe covers. I agree with Spagirl's comments though - shoe covers seem tacky and might suggest that you demand an unreasonable level of cleanliness. If your guests refuse to remove their shoes for whatever reason, and you continue to try to find ways to prevent their shoes from touching your floor, then your guests might start to think you have OCD. You are definitely gonna have to go for the strong and memorable strategy, but make it fun and amicable. Organize a party and add the "no-shoe" term in the title of the invitation, make it sort of the main theme. Because you are not asking for a favor, this is official. People remember the purpose of a space, the invitation is communicating something about your lifestyle making it sound more fun instead of clean. Timing is more important than message structure. Would actually work if you say it when you arrive home with your friends at the moment the door is unlocked and being opened, not before opening the door and not after opening the door, but at the same time the new space to transition into is being revealed. This particular timing will make your audience link your words with the time and space they're expected to modify their behavior, you are adjusting their mindsets just little bit, a significant enough little bit. Remember that very few people are used to this so we are the ones going against culture and common sense, but that's OK, there's definitely a way to make people understand and remember. The shoe basket is a nice start but you need to make it 3dimensional to have better results. Our minds set our behavior very much based on the place we are navigating, architects know this, in fact, that whole profession is pretty much based on this concept, the experience of the space. Even atheist people behave in a certain manner when visiting a catholic temple as tourists, and people who are usually very territorial about their personal space dare to surround themselves with a bunch of strangers at a dance floor on a night club. Redecorating the entrance could look fantastic and also help you convey the message. But I'm afraid you are gonna have to do something that looks ugly at first and keep it there for a while until people get used to it, trace a clear rounded or squared line on the floor that marks a noticeable frontier/border from side to side where shoes are allowed for them to remove them. Add a place to sit next to the line delimiting the shoes-allowed area, so they can sit and go about the business of taking shoes off, putting slippers or socks on or whatever. Reinforce your message since before anyone enters your home, make it as friendly as possible. Cue repetition is important to avoid verbal intervention. 3. Provide actors with "props"
Although the recommended washable slippers are a great option... if you want to enforce the rule/policy maintaining a positive vibe, you can provide personal slippers as a gift for each one of your most regular visitor friends, even adding their name to the pair of footwear. No one else can use them and the slippers remain home unless your friend gets very enthusiastic and wants to carry your gift everywhere in their backpacks (it could happen). I wished this was not necessary to bring but I mention it so you are successful at enforcing your policy, influencing other people's behavior requires commitment on your part too, make sure your place is always extremely, super clean like you said you like having it, and you will succeed. 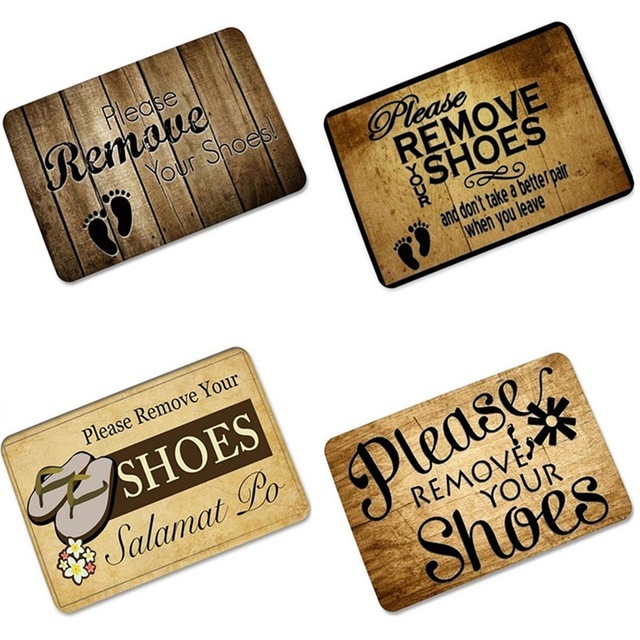 This way, your visitor will appreciate it and be more comfortable taking their shoes off on a regular basis because they trust you care about the place being clean. You might want to suspend your no-shoes policy during times you don't have time to clean or can't hire someone to do it. There was a friend that shared my no-shoes policy but she had a hard time keeping it clean because she had just had her first child and she has cats, getting surprise gunk or invisible sticky goo on one foot or sock is extremely disgusting, the person encountering this situation won't be able to put their shoes on because that will infect them on the inside where it's marginally possible to clean and they might or might not tell you about it, but they will definitely not feel safe walking barefoot or on socks in your house ever again. 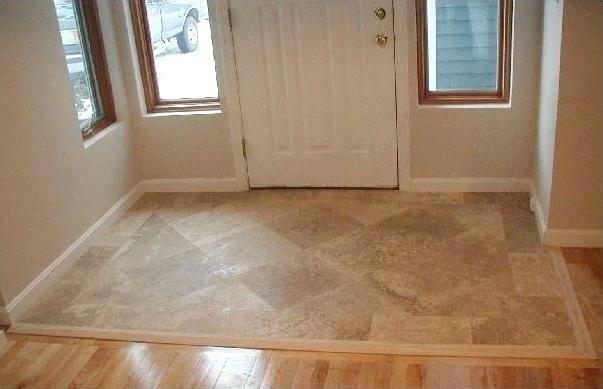 Keep all areas where someone might want to take their shoes on/off clean, including the garage. On a side note: You might want to mop the floor every time you have people visiting anyways, because you don't really know how healthy are everyone's feet, I'll defend that by saying I'm not germophobe but rather germoaware because I used to have problems with my feet when sharing shower and shoes with my brothers while growing up, I hated it. People who love having our feet perfect tend to obsess about it and obsess about and enjoy their partners' feet too, but beyond that, you can't control, choose or enforce everyone's feet health habits. Second guessing the health of stranger's feet conditions and health can disturb a stomach. If more people knew having healthy feet is not that hard at all, things would be easier for you. People who don't want to take their shoes off might be aware they have an infection, don't make them feel so awkward, street dust at sunny cities are germ free, you might prefer the dust. Well you will have the shoe bags/covers for that situation. Having a shoe rack for placing smelly used (and not so cheap) slippers may not be as convenient as you might think at first (especially for strangers who might think it's a private shoe rack). Having a small seat at the entrance with these plastic bags clearly visible on it will also allow more people to understand your intention without the need for you to say a word (a written paper might help too). I found, used and reused these a few times when I travelled in China. In a few houses I visited at first, the owners would request me to wear them and would gladly dispose of them when I left. Later on, if they were not too dirty, I'd keep them myself and reuse them next time. I even reused these in a few stores making the employees a bit happier (especially in cats and dogs rains). I have the same policy, and I live in the US. I find that this takes a 3 step approach. 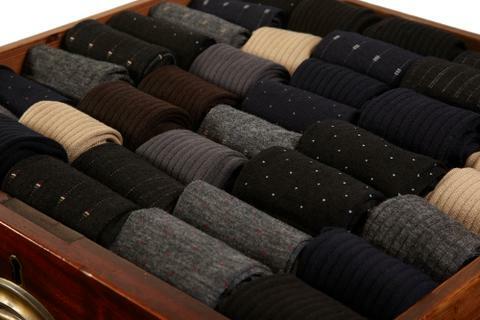 First is the visual cues, you're already doing that with the shoe rack. Don't be afraid to have a shoe mess by the door. If a guest has to step over a pile of shoes, they're less likely to be ignorant of the fact that they shouldn't be wearing shoes either. I would also suggest that the first time someone comes over (or as a reminder to the ones that don't seem to get it) you make a "big deal" about taking your own shoes off. If someone is nervous about being barefoot in your house then provide slippers. Just be careful. A lot of people would find shared slippers very gross. Second is a gentle reminder. "We don't wear shoes in the house." Is great. I actually check and leverage the kids with more stubborn guests. As we walk in the door, "What's the rule about shoes?". The chorus of kids responds with "No shoes in the house, they stay by the door." A really stubborn guest might get the wall treatment. I would stand in the entry basically blocking the way until the shoes came off, but that's a bit extreme. I have had to do it through a couple of times. Third, and hopefully, you never have to get here (though you might, I have), is a strong reminder. "We don't wear shoes in the house. If you want to wear shoes, then please leave. I will see you tomorrow." Remember, in the end, it's your house, and you can impose any rules you want. Most guests get the hint long before you reach this stage, but if you have to get here, make sure you are firm but polite (as much as you can be when removing someone from your home), state why you're asking them to leave, and try to make sure that you mention speaking with them again in the future. You're not kicking them out of your life, just your home. Visual cues and a gentle reminder will get 99% of your guests to comply. If you really have to strong arm it, then consider the fact that perhaps these people shouldn't be guests in your home, and you should instead meet them on more even grounds. Yowers! There are a lot of very forceful answers here. It is possible to get this done and remain friendly and inviting. Take off your shoes, come on in, and make yourself at home! We don't assume that they remember from a prior visit. It's not their job to remember our house policies. We just say the statement when we open the door. I've never had to correct anyone or strong-arm them beyond this simple, warm sentence. It's friendly, easy, and straightforward. Be explicit. Ask guests to remove their shoes at the door and then stand in the hallway, ostensibly waiting to show them into your apartment or continuing an earlier conversation while they unlace, but actually creating a barrier between them and the interior until their shoes have been removed. Many people do not mind removing shoes and will not mind being asked. For those "problematic" friends who are just being lazy, they will quickly realise that it is less effort to comply than it is to attempt to circumvent your policy. For many people, however, removing shoes in public or in another's home can make them feel uncomfortable, even vulnerable. They will not enjoy the experience any way you present it. You cannot make it friendly, welcoming, cute, whimsical, or fun. It will be an unpleasant experience. Relative to the inherent hostility of dismissing your guests' discomfort, any awkwardness at the door is likely to be negligible. This also gives them a chance to bring their own slippers if they should choose. What inspired me to answer here was the thought of telling someone you don't have shoes in your house well before they got there. This sets up a no-win situation. When you arrive, if you tell them again, you are insulting their intelligence because you already told them. However, if you silently expect them to remember, and then they forget, now what? Either you bite lips as they tromp around your house oblivious, or you remind them and make them feel bad for forgetting, which is not a flattering look for you either. Sidestep that; tell them literally as you unlock the door. In fact, telling them in advance also sends a more subtle signal: that you are reluctant or are of two minds of having me come over, and saying it (now) is a subtle discouragement. I would treat that at full value: if we were approaching a cafe, my proposal would be "Oh, wouldn't a pastry sound good? Let's visit here for awhile, I'll buy" (read: instead of going to your home). I would not want to put you on the spot of having to contrive another excuse to not invite me in. So on exiting the cafe, I'd say "It was really nice to spend time with you!" without closure, i.e. with no indication of needing to be anywhere else. (Read: if you really want me to come over, this is your opening to be inviting). It's far worse if they've already been there and botched it. Because when you remind them well before your arrival, what appears between the lines is "Beautiful day, good company, and what comes to the front of my mind is insulting you twice: first bringing up how careless you were with the shoes the last time, and now presuming you are too stupid to have remembered. That is literally the best thought I can think right now. Oh, and expect to be reminded again at the threshold." Such a faux pas is no place from which to call out their social graces. It's really tempting to think of your shoe-free policy as some sort of "right" and then get righteous about it -- especially when you do it long enough to "normalize" it. But that's not so. You have every right to make your house a shoe-free zone, but they don't have any duty to help. And so the burden lands on you to get them to do it; everytime, with tact and grace. Yes, that can get exasperating. But when it feels exhausting to tell people over and over, just check yourself -- you have fallen into the trap of thinking of your shoe policy as an entitlement they owe you. That is not being a courteous host, so get out of that trap. It's your job, and you can make it a lot with props, signs, slippers and other indications as the other answers have discussed. But again, don't expect to be owed people reading the signs and going along with it. When someone errs, politely correct them and forget about it. That's it. 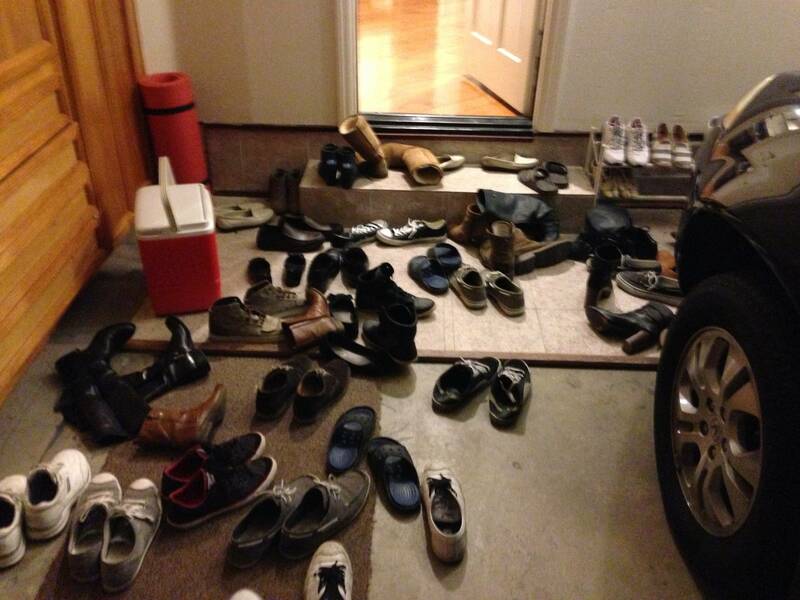 If you are entering the apartment at the same time as your friends, simply take off your shoes. They may see it as a cue that they should take off their shoes as well. Try to make it obvious by maybe turning yourself toward them and make it obvious that you are taking off your shoes/boots. Perhaps also try to have large mat as some others have suggested so then there is a place where they can leave their shoes, and they don't have to use the rack. This is not a shoe problem at all. You are in your apartment, you have said to do X, and the person disobeyed you. You can substitute "taking shoes off" with any other action and it still would be same. And ask "What have I said about shoes in my home?". It's your home, and your rules. People who disobey your rules have no place there.Another option would be to instill a penalty: Announce in advance that any person who walks in in shoes has to vacuum and mop the floor. This way or another, it's your job to enforce your rules. Putting rack in plain sight is hint but hints never work. I think that you're afraid of that person not wanting to visit you anymore. Unfortunately, there are only 2 options: either you accept dirt in your home or you force that person to do your bidding. And that will always be unpleasant for someone who doesn't want to care about shoes. Not the answer you're looking for? Browse other questions tagged friends united-states boundaries or ask your own question. How to manage expectations around a vacation offer from family? How do I tell my kids it's time to get off of the computer? How to tell partner we need boundaries?